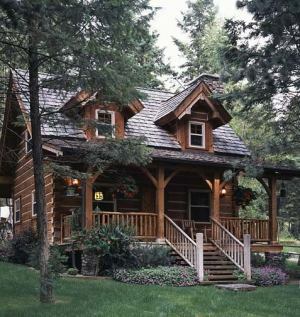 Standout Small Log Cabin Plans . . . BIG THINGS in small packages! The small log cabin plans featured here pack a lot of punch inside their little packages. Cozy, picturesque exteriors belie the "living large" space found inside. If ever there were a fitting cliche for these diminutive structures, it is this one: "Don't judge a book by its cover!" The architectural gems pictured below may appear tiny on the outside. However, it's a completely different story inside. Well-designed and efficiently arranged, the interiors are surprisingly spacious with a look and feel that is much larger than you may expect! The small log cabins shown here range from only a few hundred square feet to just under two thousand square feet. Many also include a rustic stone hearth for added ambiance and charm. The heart -- or hearth -- of many log cabins, a great stone fireplace is not only the focal point of the room over which it presides, it is the prominent architectural element that anchors the entire structure. The dominant design element around which family and friends gather when getting together. The single most important place in the cabin to go for solace and comfort. Warmed by a crackling fire, we turn our thoughts away from the hustle and bustle of everyday life and let our imaginations wander . . . . . and wonder about simpler times and log home life long ago. As if stepping into the canvas of a Terry Redlin painting, we immerse ourselves in the idealized reality of an earlier, gentler time. Take a step back and lose yourself -- at least momentarily -- in the idealized reality of an earlier, gentler time. Simply click on the title next to each of the following images to view floor plans and additional photos of each design . . . . . . . and turn your dreams into ACTUAL reality! 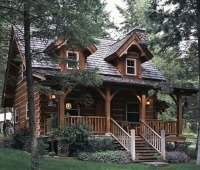 Please check back often or subscribe to our RSS feed, as we frequently add small log cabin plans to our site.